Hildegurls: Electric Ordo Virtutum, is up for a Grammy Nomination for Best Classical Album. Adapted from Hildegard von Bingen‘s 12th c. Ordo Virtutum for 21st c audiences, the work itself premiered at the Lincoln Center Festival 1998, in co-production with American Opera Projects. The production was conceived and directed by former AOP Artistic Director Grethe Barrett Holby, working alongside composers-performers Lisa Bielawa, Kitty Brazelton, Eve Beglarian, and Elaine Kaplinsky. The CD was released by Innova this past May, under the direction of Innova Director Philip Blackburn. Members of NARAS voted on the semi-finalists on October 9th, and the final nominees will be announced in December. The CD is on sale through Amazon, Barnes and Noble, and the like. The CD contains an annotated libretto with translation from the original latin along with scene breakdowns and explanations, and extraordinary photographs of the Lincoln Center Festival production. 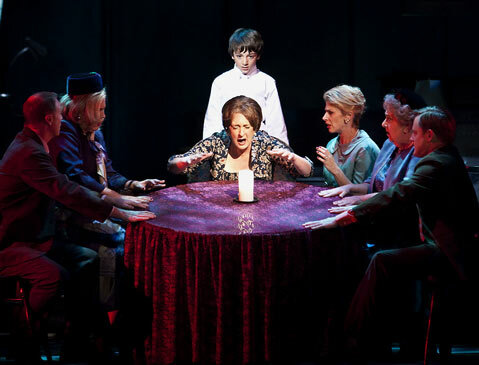 AOP attends Seance premiere; Reviews are in! AOP Board President Robert E. Lee III and Company Manager Matt Gray were on hand for the gala premiere of Stephen Schwartz‘s first opera Seance on a Wet Afternoon at Opera Santa Barbara. AOP artistic partner and star soprano Lauren Flanigan battled through a head cold and delivered a seemingly effortless bravura performance in the role of Myra, a psychic medium who convinces her husband to participate in a kidnapping scheme that will bring them fame and fortune. The premiere also featured frequent AOP singers Caroline Worra and Michael Marcotte. Charity Wicks was the assistant conductor to Maestro Valery Ryvkin. A commission by Opera Santa Barbara and produced by Michael Jackowitz, AOP had developed the project since its first workshop in 2008 that was held at South Oxford Space in Brooklyn and the Rose Studio in Lincoln Center with additional public workshops at the Angel Orensanz Theater in the Lower East Side. And the reviews have started pouring in! Philadelphia audiences finally got to experience the multimedia opera-theatre work Darkling when it premiered in a new, semi-staged version for the Philadelphia Fringe Festival presented by Center City Opera Theater on Sep 8, 10, and 12, 2009. Conductor and CCOT Artistic Director Andrew Kurtz brought composer Stefan Weisman and librettist Anna Rabinowitz‘s haunting experimental work to life as part of ConNEXTions 2009: The Next Generation of Opera. Spanning the decades from the 1930’s to the post-World War period, Darkling is a remarkable story of a poet who struggles to identify and interpret the stories of various Polish-Jewish family affected by the extraordinary events of the Holocaust based only on the few letters and photographs they left behind. 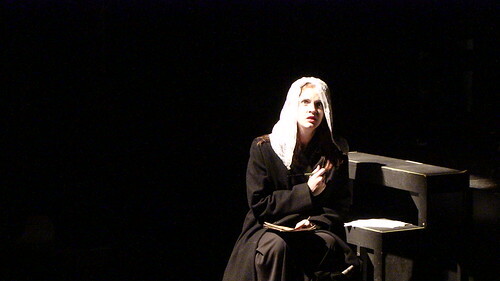 Maeve Hoglund as the bride fleeing to America in the Sep 2009 performance of Darkling in Philadelphia. Returning singers Hai-Ting Chinn and Jon Garrison joined with Maeve Hoglund, Martin Hargrove and Jason Switzer, narrator Sharon Sigal, and a string quartet under the stage direction of Matt Gray. 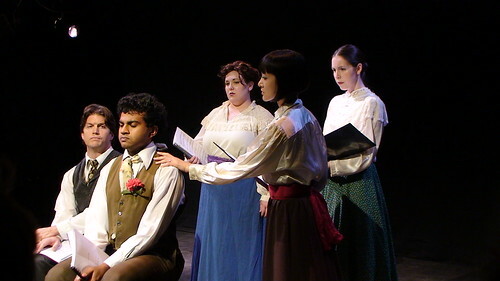 AOP premiered Darkling in 2006 at the East 13th Street Theater in a fully staged version conceived and directed by Michael Comlish. A concert version also developed by Mr. Comlish toured through Europe in 2007. You are currently browsing the Have a Voice blog archives for October, 2009.